Everyone learns at her own speed. Some students will advance more quickly through the levels, and others will need more time. It's all good! I want you to be the best dancer you can be, and I want you to have fun doing it. Most students find that they need to spend a minimum of three sessions to a year in each level. LEVEL 1 BEGINNER Introduction to Tribal Style Bellydance. LEVEL 1.5 ADVANCED BEGINNER Introduction to zils. Review and fine-tuning of level 1 steps. OFFERED AS THE NEED ARISES Dress- Choli & pantaloons or skirt suggested. Zils are required. LEVEL 2 INTERMEDIATE Intermediate level steps, group improvisation skills, and zils. Dress - Choli & pantaloons or skirt suggested. Zils are required. 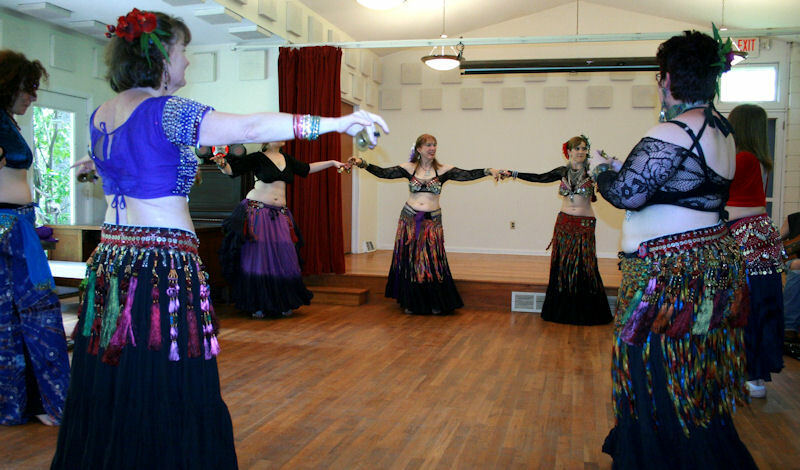 LEVEL 2.5 ADVANCED INTERMEDIATE Tribal Belly Dance never had to be performed in public! It is primarily a social dance. This class is designed for those dancers who are not interested in performance training, but who want to challenge themselves. Some advanced steps are taught, as well as sister dueting. Less emphasis on drill work and more focus on dancing in half-circles, circles, and open chorus. Prerequisite One complete session of level 2, mastery of the intermediate level steps, group improvisational skills and proficiency in leading and following. OFFERED AS THE NEED ARISES Dress - Choli & pantaloons or skirt suggested. Zils are required. LEVEL 3 ADVANCED Performance training, balancing skills, skirt work, sister duets, stage makeup, & advanced level steps. While performance is not mandatory, performance opportunities at haflas and student events will be offered. Dance classes twice a week or some other form of physical conditioning in addition to dance class is recommended at this level. Prerequisite - 3 complete sessions of Level 2 and permission of the instructor. Choli & pantaloons or skirt suggested. You will also need zils, kneepads, and a prop for balancing. No refunds unless the class is cancelled. By agreeing to participate, you the student assume all risk and responsibility for any injuries incurred during class time or elsewhere. Bonnie Reese dances as a member of Tapestry Tribal, a cooperatively run dance troupe. Bonnie's teaching business is independent of the other members of Tapestry Tribal. Bonnie Reese and Tapestry Tribal cannot assume any liability for injuries incurred by you the student.